Google Toolbar has a feature that lets you see the PageRank for all the pages you visit. It's not enabled by default, but Google Toolbar asks you if you want to enable the feature when you install the plug-in. 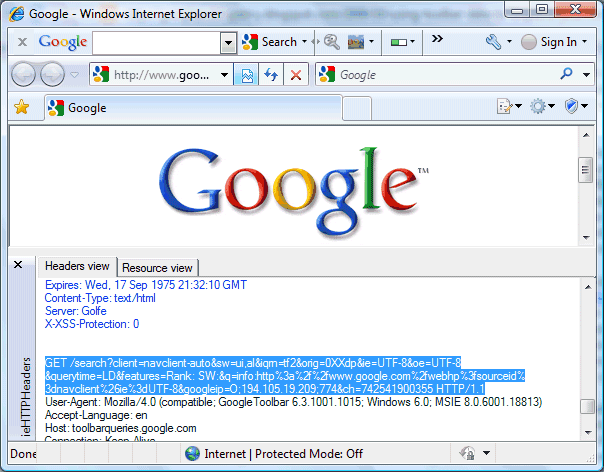 To show you the PageRank for any web page you visit, Google Toolbar sends the URL of the page to Google's servers. In other words, you're sending your entire browsing history to Google. If you don't enable the Web History service, the data is not connected to a Google account, but it's still useful. Google Public Policy Blog mentions two uses of this data. "By getting a better sense of the most visited sites on the web, we're able to focus Google's automated malware scanners on the most popular URLs that users are currently visiting. Another example of the usefulness of this data is around measuring page load times. (...) For example, when your browser sends out a request to fetch Google Maps, we start the timer. When the page is finished loading, we stop the timer and send the elapsed time back to Google along with the Google Maps URL request." As you can see from the screenshot above, Google Toolbar sends all kind of information to Google servers, including a parameter called querytime, that could be related to measuring page load times. Google not only knows which are the most visited pages, but it can also track their loading times in a variety of hardware configurations. Presumably that GET goes out over HTTP, so in any open WLAN you can listen to the URLS people hit, even if they are going to HTTPS sites where normally the URL itself would be hidden. Nice. Another reason to turn it off. Or at least retain it on a "for emergency use only" browser like IE. I think you can see it also in Firefox but you have to enable it before. It tells that it will send some stats to the datacenter (It is something like that I am not sure now). Google stores many information of users like display in this blog. All personal information is maintain by google. I never see this type of information in my firefox. It does not matter what big service you are using, every service spying to get more information about the user and to use this information for "better search results". "Google not only knows which are the most visited pages, but it can also track their loading times in a variety of hardware configurations." Please explain to your readers how on Earth based on data received from GET queries or even through Analytics JS scripts you can track users *hardware* configuration? What exactly is you track with hardware? Its Strange news, i think we need more information on this. oh my God! that means Google knows all of our browsing data? how come i remove it.